Irish Record 16lb 6oz taken on 29.10.1983 by Thomas McManus at Shimna River. The eyes are situated slightly above an imaginary line drawn horizontally through the tip of the snout. Un-like the Salmon where the wrist of the tail narrows dramatically, the Sea Trout’s tail wrist is considerably thicker, and the tail-fin profile squarer, lacking the “deep-fork” of the Salmon. Back colouration is usually dark olive leading to bronze and then silver flanks, sometimes with hues of green, blue or iridescent peach, with pearlescent white under-belly. The back, flanks and cheeks are covered in numerous small, black markings. Fish that have spent time in fresh water will take on the colouration and pattern of Brown Trout. 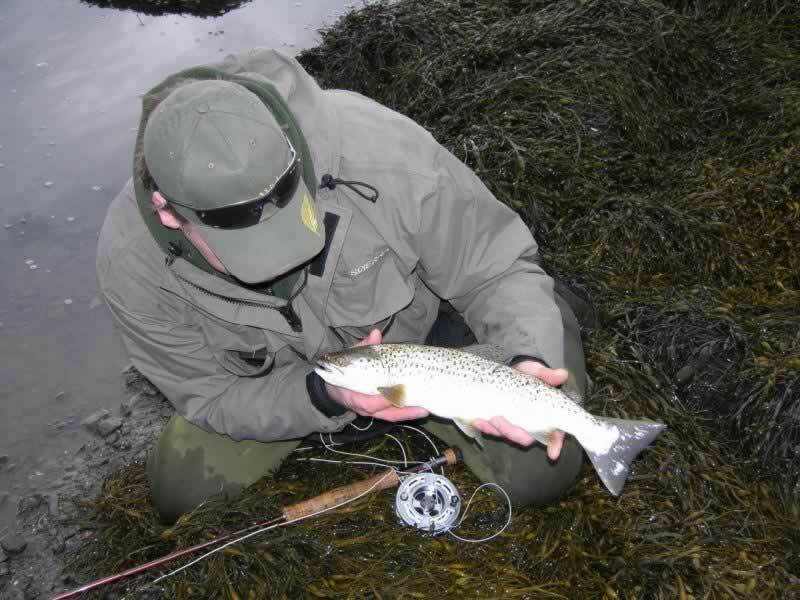 West coast estuaries and Loughs offer excellent sport although Sea Trout are present around most of the Irish Coast. In salt water, they are drawn towards fresh water such as estuaries, small river mouths and even natural drains that run directly into the sea or across beaches. They are an excellent target species as they rarely travel far from the shore-line. 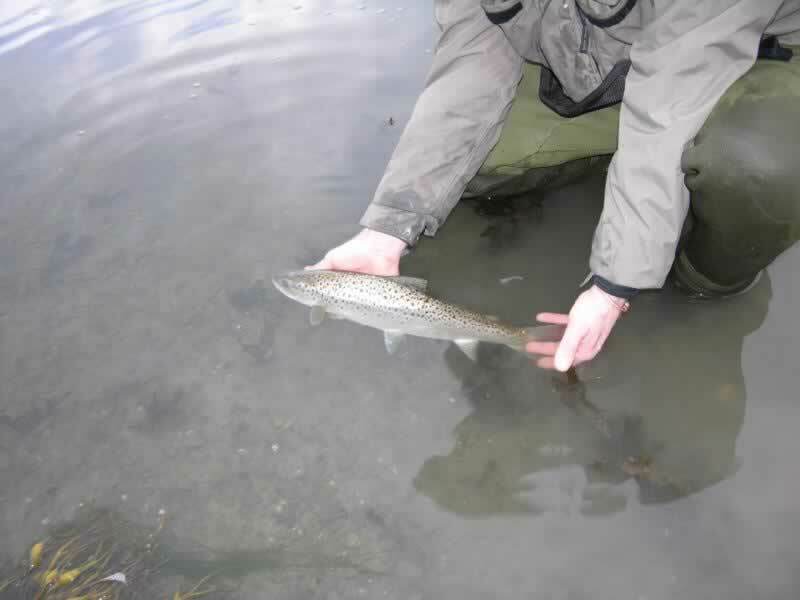 During the spawning season, they will venture into most of our Irish river systems. Un-like Salmon, Sea Trout will not necessarily return to their river of birth, but may investigate any suitable fresh water way that takes their fancy. Generally, the close season runs from the end of October to the beginning of March, or where private river stretches dictate. They are present for most of the year, especially on open surf beaches through the winter months. Accidental captures during close season or where the angler does not hold a valid game licence, the fish must be released immediately. 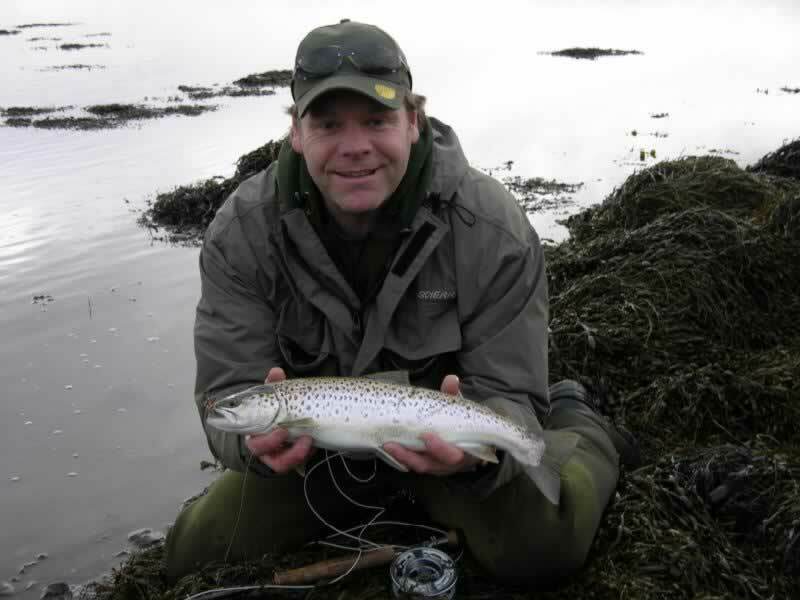 Check out this link for updated details on when and where, http://www.fishinginireland.info/salmon/seatrout.htm. 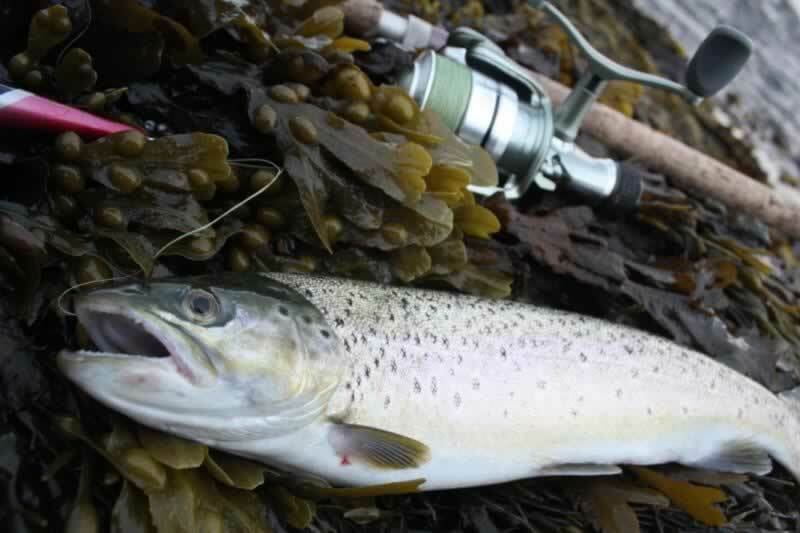 Sea Trout are taken on a multitude of bait and various methods. Fly fishing and spinning are excellent and float-fished or free-lined Sand Eel can be devastating on many coastal venues. 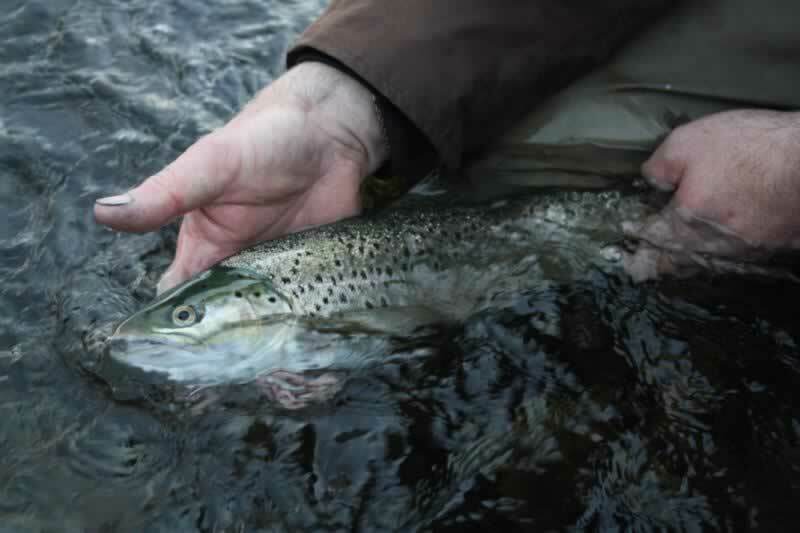 When targeted in salt water, Sea Trout are relatively easy to catch. Spinning methods using popular lures such as Abu Toby’s are lethal. The silver version and the black and gold work extremely well, in size 10 grams. Other bait-fish patterns such as the “German Spratt” and the “Green-fish” are superb. Also consider frozen Sand Eel, either float-fished or free-lined. I have taken numerous large Sea Trout on this useful method. However, from a personal perspective, the most exciting method to target Sea Trout, either in salt water or fresh water has got to be on the fly. 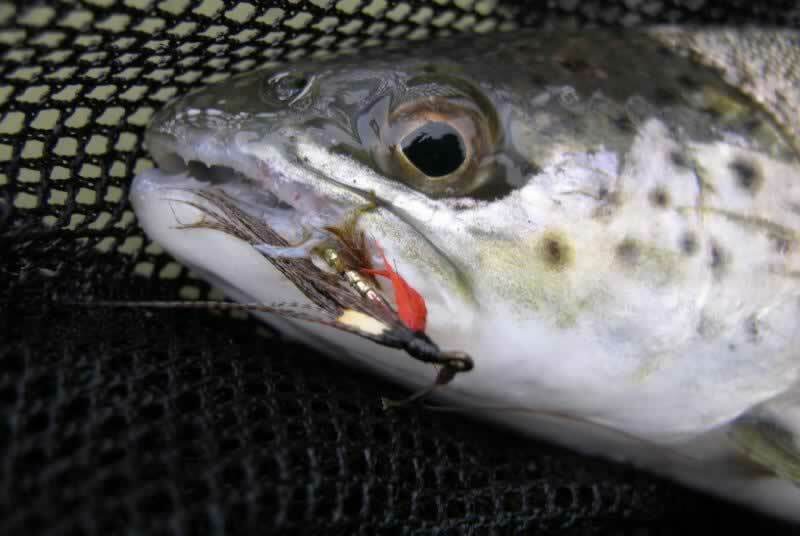 The powerful take and tremendous battle put up by this species on balanced fly kit is a pure adrenaline rush. A slightly heavier outfit is required to cope with coastal conditions. A nine-ten foot 8 wt rod and a minimum of 6lb leader will cope with most conditions encountered. 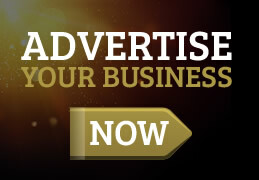 As for the flies, a range of typical bait-fish and Sand eel patterns and the usual wet fly patterns such as Teal Blue and Silver, Peter Ross, Black Pennell, Butchers and Dunkelds.